A brief introduction and history of the nomination of the Gondwana Rainforests of Australia World Heritage national parks of New South Wales (NSW) and Southeast Queensland (QLD), Australia. Although rainforests cover only about 0.3 % of Australia, they contain about half of all Australian plant families and about a third of Australia's mammal and bird species. Selected as World Heritage sites for their exceptional biodiversity or rarity, the Gondwana Rainforests of Australia have an extremely high conservation value and provide habitat for more than 200 rare or threatened plant and animal species. 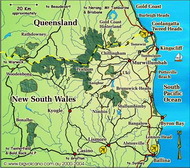 The property currently contains more than 50 World Heritage listed national parks, flora reserves and nature reserves of various rainforest types, which streches for more than 500 kilometres , from Gloucester in the NSW Hunter region, just north of Sydney, to Boonah in QLD, more than 900 kl to the north. The current total area of the property is 366 507 hectares (ha. ); 307 284 ha. in NSW and 59 223 ha. in QLD. The parks and reserves are variously comprised of four of the five major recognised rainforest types, and include some of the few remaining stands of old growth (undisturbed) forest in NSW. The balance of listed "properties" are made up of large remnant pockets and regrowth areas of rainforest, which were able to meet the criteria for World Heritage listing. Originally nominated as the “Australian East Coast Temperate and Subtropical Rainforest Parks”, 16 sites in New South Wales comprising more than 203,000 hectares of national parks, flora and nature reserves, were included in the inital 1985 World Heritage application. After being independently evaluated by the International Union for the Conservation of Nature, the nomination was presented to to the United Nations Educational, Scientific and Cultural Organisation (UNESCO), by the Australian Commonwealth Government in 1985. Most of the nominated properties were accepted for inclusion on the World Heritage List in November of 1986, as the Australian East Coast Temperate and Subtropical Rainforest Parks World Heritage Listing. Queensland additions to the nomination since the original submission have increased the number of reserves and national parks in the property , with that nomination formalised in 1994, and renamed the “Central Eastern Rainforest Reserves ”, or CERRA. Australia's World Heritage, brochure: Commonwealth Department of Environment, Sport and Territories 1994. A Natural History - Tweed Gold Coast Region: BW Graham, published by Tweed River High School Library 1990. 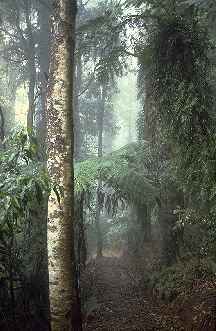 New South Wales Rainforests - the Nomination for the World Heritage List (revised): Dr Paul Adam, published by NSW National Parks and Wildlife Service 1987.